Rob LaScala and Alicia DiMichele with former Gov. 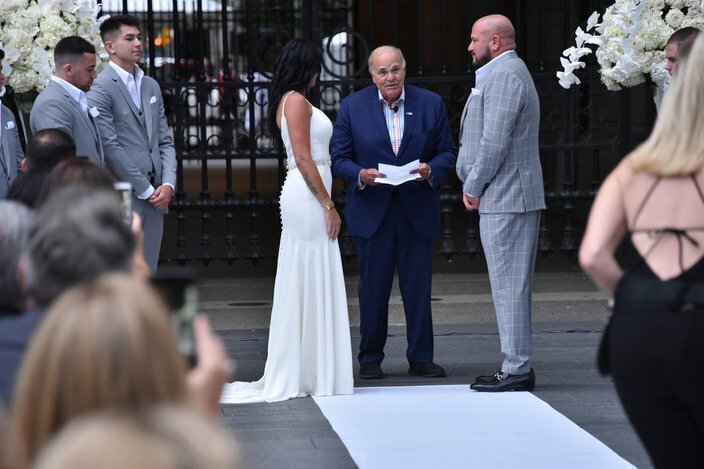 Ed Rendell, after he officiated their wedding at Dilworth Park, on Saturday, Sept. 22, 2018. 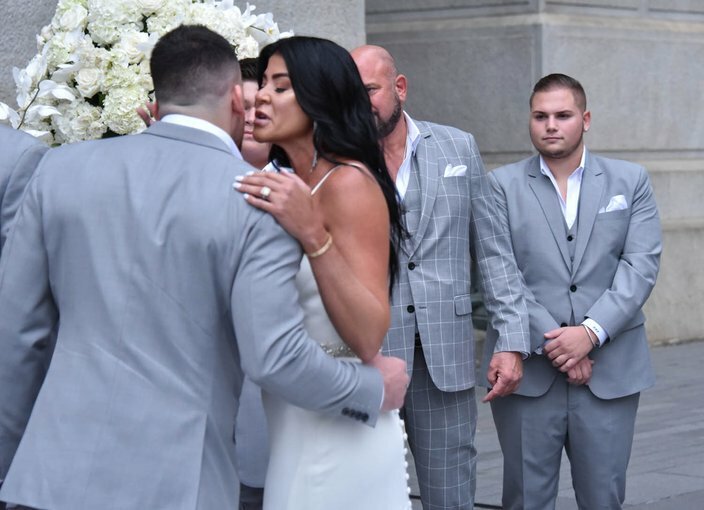 Alicia DiMichele, owner of Alicia DiMichele Boutique and former star of "Mob Wives: New Blood," married her longtime boyfriend, restaurateur Rob LaScala, of LaScala's, Pronto Pizza and LaScala's Birra last Saturday at Dilworth Park. The wedding was officiated former Gov. Edward Rendell. About 100 friends and family were on hand to watch the intimate ceremony. The bride was walked down the aisle by her sons, Anthony, Rocco and Carlo, where, at the alter, LaScala and his son, Lorenzo, were waiting. The bride wore an off-the-rack white gown, and her husband and sons wore custom suits by EDGE Tailoring in Marlton, N.J. 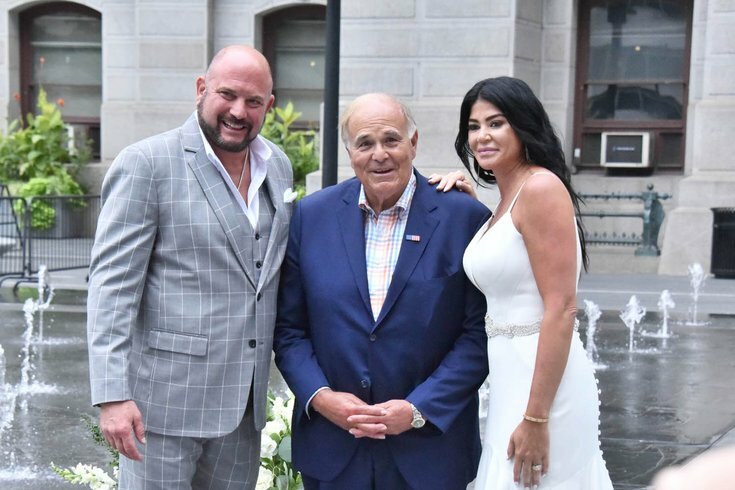 Spotted at the wedding was Dorothy Toran, Executive in Charge of Production for Sirens Media, which also produces "Real Housewives of New Jersey." It's been a recent rumor that DiMichele will either be joining the RHONJ gang, or will there finally be a "Real Housewives of Philadelphia," starring DiMichele. (We will wait and see.) 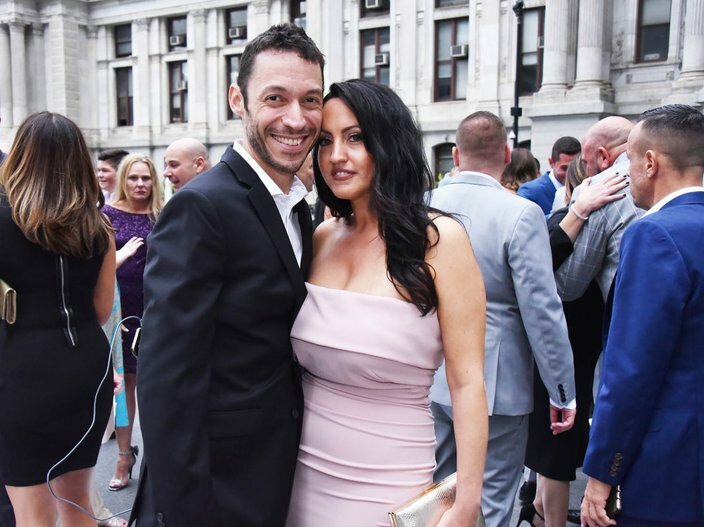 After the ceremony, guests headed to LaScala's at 6th and Chestnut streets, where DiMichele changed into a white romper by Dollhouse, a boutique based in London. 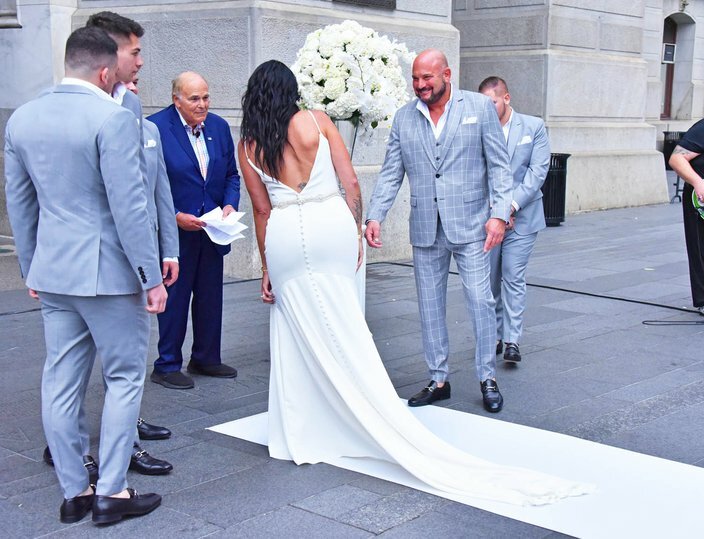 Alicia DiMichele is flanked by her sons, Carlo, Rocco and Anthony, as they prepare to walk her down the aisle into their future at Dilworth Park, on Sept. 22, 2018. Rob LaScala greets his wife-to-be, Alicia DiMichele, as she reaches the alter, with their sons and officiate, former Gov. Ed Rendell looking on at Dilworth Park on Saturday, Sept. 22, 2018. 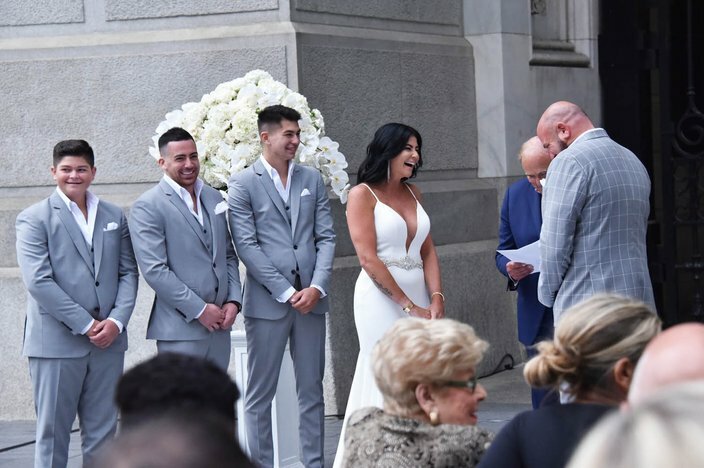 Alicia DiMichele kisses her son, Anthony, as she arrives at the alter, as her future husband, Rob LaScala, and future step son, Lorenzo LaScala, look on at Dilworth Park, on Saturday, Sept. 22, 2018. Former Gov. 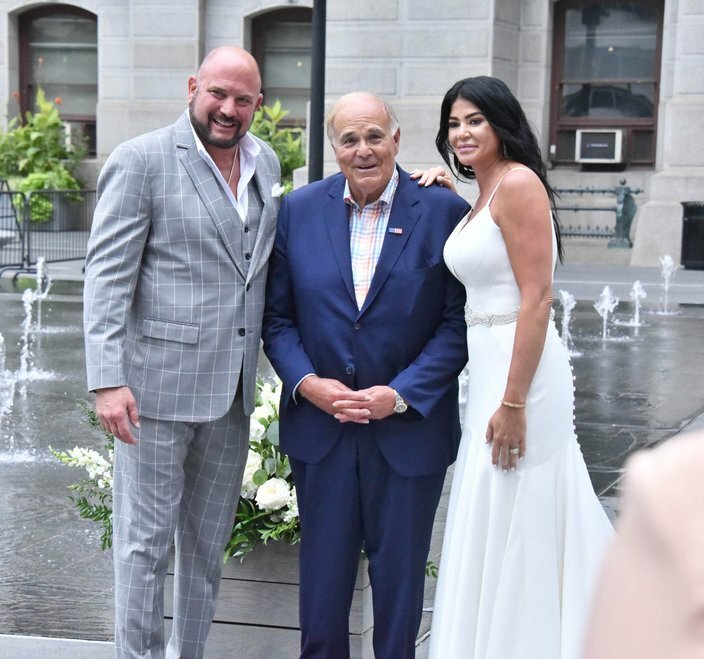 Ed Rendell officiated the wedding of Alicia DiMichele and Rob LaScala at Dilworth Park, Saturday, Sept. 22, 2018. Alicia DiMichelle and Rob LaScala take their wedding vows at Dilworth Park, on Saturday, Sept. 22, 2018. Alicia DiMichele and Rob LaScala take their wedding vows at Dilworth Park, on Saturday, Sept. 22, 2018. Vince and Maureen Vecere at the wedding of Alicia DiMichele and Rob LaScala at Dilworth Park, on Saturday, Sept. 22, 2018. 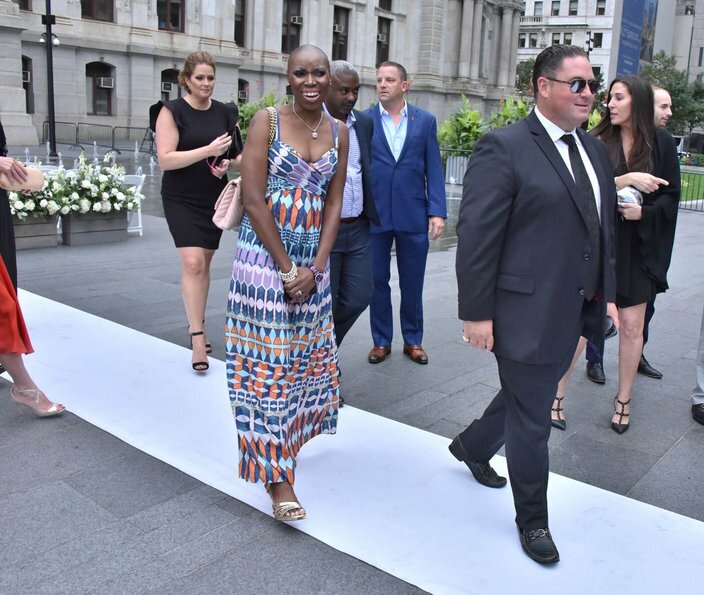 Dorothy Toran, Executive In Charge of Production at Sirens Media attended Alicia DiMichele and Rob LaScala's wedding at Dilworth Park, on Saturday, Sept. 22, 2018. Guest Alissa Frederico, Jill Rizen and Andy Henning attend Alicia DiMichele and Rob LaScala's wedding at Dilworth Park on Saturday, Sept. 22, 2018.